I see so many people getting tattoos lately and I have to say that I am quite jealous! 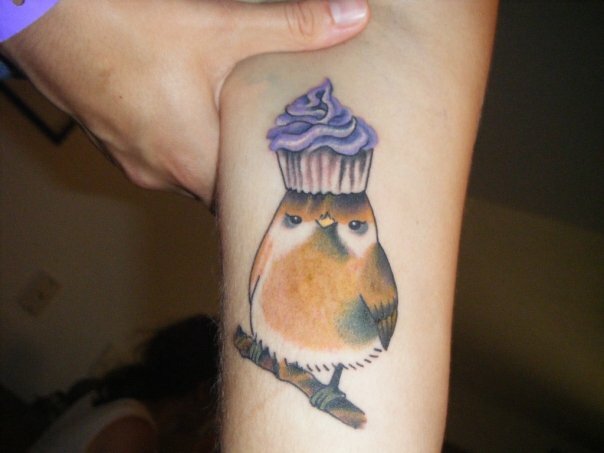 So I've been scouting the internet for fun ideas and of course you know that cupcakes are on the top of my list for tattoos. Some are cute and some are just really strange. I like to get ideas and sit on them for awhile, probably about a year or two, before I go out get inked. It's a big deal to me, so before I fill up all the space on my body I want to make sure I have what I want. I have 2 tattoos that need to be fixed, so those will be getting done first. But for now I like to day dream and find inspiration. I really love her sleeve and the cupcake at the top is cute and fluffy. 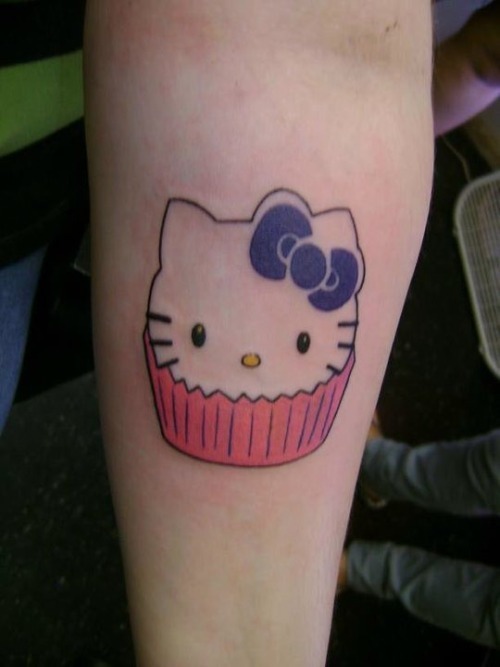 This Hello Kitty cupcake tattoo is cute too. But i'm not sure I'm lovin the outline part in the top right. It's still cute and simple. I think this tattoo is very cute! Though the bird doesn't quite look like an owl. Still it is amazingly done. This T-Rex cupcake tattoo is pretty awesome. It has amazing detail. I personally wouldn't get it but I think it's really cool. Also my giveaway is still open and closes Tuesday at midnight (East coast time) you can find it HERE. I hope everyone is having an awesome Sunday!